Perfect Location! 1 block from the Beach, Sleeps 10. Please Note: Owner does not rent to prom groups. Any guest under 21 must be accompanied by parent/guardian. This spacious beach house is located just steps away from the Seawall. Recently remodeled inside and out to provide a unique coastal vibe, while preserving the character and charm of this 100 yr old home. Located on Galveston’s east end, Blue Wave Beach House is located 1 block from the beach and The Spot Restaurant and just 8 blocks from Pleasure Pier. Inside you’ll find original hardwood floors, a large great room featuring comfortable seating, a 37” flat screen TV and large dining table. The newly renovated kitchen features granite counter tops and all cooking utensils essential your stay. A washroom complete with full size washer and dryer is available for your convenience. Also downstairs, enjoy the guest bedroom with a pull out sofa, TV and DVD player. Retire upstairs to the spacious master bedroom with French doors leading to a private balcony overlooking the Seawall. Relax with a nice glass of wine while watching the vibrant lights of Pleasure Pier or wake up to watch the sunrise while listening to the waves roll in. Upstairs there is a seating area; a great place to curl up and read a book. There are 2 additional bedrooms upstairs, both with queen size beds. The perfect weekend getaway boasts a backyard private deck perfect for an afternoon cookout. Start your day out with an early morning cup of coffee on the front porch while enjoying the gulf breeze and watching the friendly locals take their morning strolls to the Seawall. Relax on the beach: Located 1 block from the Seawall- just a 2 minute walk to the beach. Fantastic restaurants, family entertainment, shopping and nightlife all within walking distance. Island destinations include: The Strand (5 minute drive), Schlitterbahn and Moody Gardens (10 minute drive), Pleasure Pier (10 minute walk), Movie Theater (10 minute drive). To reserve the home, a $300 damage deposit and 50% of rental is required at booking. The remainder is due 30 days prior to arrival. You must be at least 25 years old to rent this home. Any guests under 25 must be related to the renter. Check in is 4 pm, Check out is 11 am. Families with children welcome! Due to the respect we have for our neighbors we cannot allow the house to be rented for prom groups. 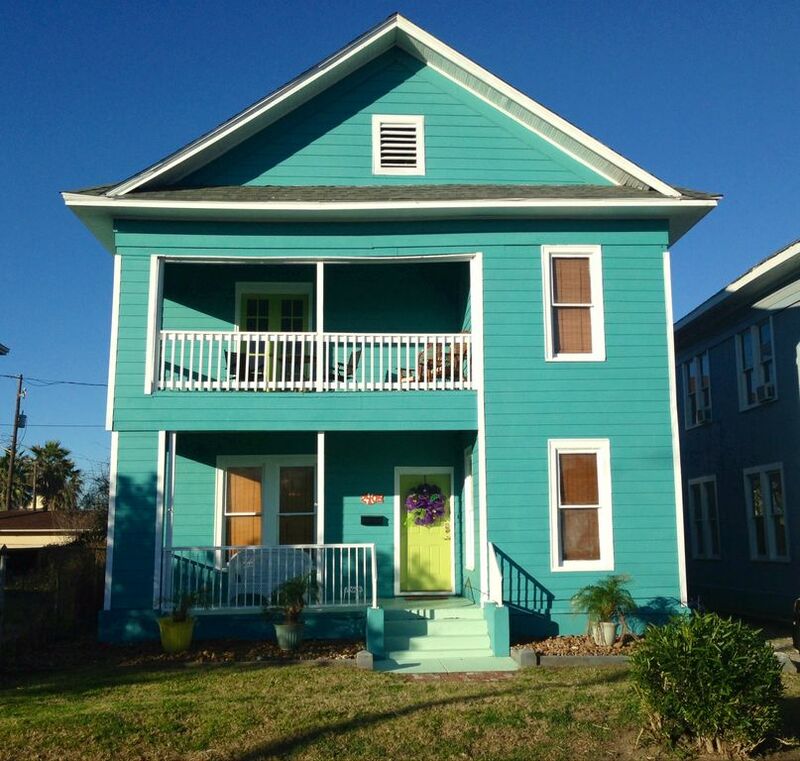 We renovated this house to have a home away from home just minutes from the beach. We would like to share the experience with you! The front porch and upstairs private balcony are perfectly suited for relaxing, feeling the gulf breeze and enjoying the sights and sounds of Galveston's Historic Seawall. Vibrant colors and beautiful original hardwood floors create a relaxing getaway for you and your family/friends to enjoy! Walking distance to many Galveston Attractions. Family and Kid Friendly Owners. Hear the waves crash and see the buzz of the famous Galveston Island Seawall from your private balcony. The house is very conveniently located to everything our party wanted. Our girl's weekend was so enjoyable. We were close enough to be able to walk to the beach, restaurants and clubs without issues. The house was comfortable and inviting. I would stay again and reccomend it to my friends. Thanks. Cute house, great location- sunny and bright! Thanks for sharing! Great location, enjoyed the deck and balcony. Perfect place for a family vacation. Looking forward to making this a family tradition! Perfect size for our family of 7. Granddaughter almost 2 enjoying her first time at the ocean. Weather could have been better, but we did all the outdoor things we intended. Also our contact people were extremely helpful and courteous, greatly appreciated. Great place. Centrally located. Close to the beach. Wonderful home. Plenty of space! Very comfortable and clean. Walking distance from almost EVERYTHING! Such a cute gem. Only caution, if your vehicle sits close to the ground like mine, be extra careful not to scrape the underbody. At the end of the day, if this property is available for our next getaway, I'd rent it again in a heartbeat! Location was excellent, house was immaculate and had everything we needed. Homeowners were very accommodating and replied right away. We will definitely be renting again.